If your expertise is in recruitment and placement, not web design, then you’ll want to read these easy tips and tricks for improving your agency’s online presence. Advice from a professional web designer with experience serving businesses like yours. 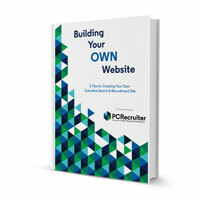 Five important items to consider when creating a website for your recruiting or staffing agency. A glossary of key terms you need to know when talking to web professionals. If you’d like to learn more about PCRecruiter, and how this affordable, flexible recruitment CRM can help your business, please use the contact form at the right to speak with one of our consultants.